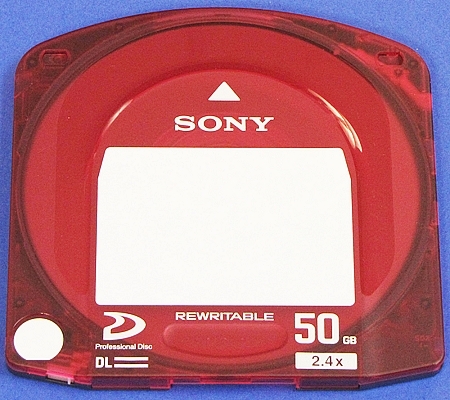 XDCAM / XDCAM HD Face Labels Laser/Inkjet Sheets - For the Sony Professional Disc, Maxell XDCAM disc or the TDK XDCAM disc. The 23 GB, 50 GB, and 128GB discs all use the same labels. Each XDCAM label sheet has eight rectangular face labels notched at the top for a custom fit into the top of the XDCAM disc. There are also 10 additional circular labels with a flat bottom edge - that are intended to be used as disc status labels to indicate HD, Master, Dub, DV, Dvcam, etc. Open Office Draw (.odg) template is also available. In a hurry to print? Use our free EasyFast software below. This PDF template will let you print quickly and easily on these sheets. It has a fixed layout of 10 lines in 12 point Helvetica Bold. Save this PDF to your desktop, then open it (opens in Adobe Reader), fill out text lines, press tab, and print! This PDF template will let you print quickly and easily on these sheets. It will let you print different text on each label, or leave some labels blank. Save this PDF to your desktop, then open it (opens in Adobe Reader), fill out text lines, press tab, and print! Removable adhesive - this adhesive label will stick well to the XDCAM disc until you want to remove it, and can then be easily removed, and so is recommended for discs that are recorded on frequently. It can be left on the XDCAM disc long term, but the Standard adhesive is a better choice for discs that will be archived. Custom offset printing of your company logo and contact info is available on this product. Click here for custom printing pricing.